Last week I got the last of my 3 installments of the Legacy Yarn Club from Mountain Meadow Wool. Before I show you what was inside box #3 though, how about I show you what I did with what came inside box #2? If you’ll think way back to April when this box arrived on my brand new doorstep, two skeins of Lincoln Wool dyed to match the summer skies from which it came. I had about 350yards of this light worsted yarn to work with and I ended up picking the Pedestrian Cowl pattern for it. 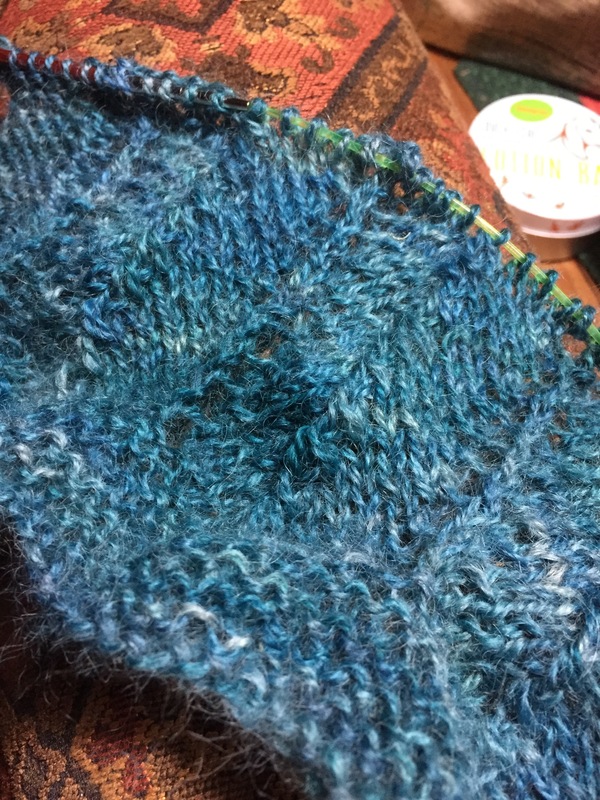 I knew I had an abundance of yarn for this project, but I had this feeling that the stitch pattern would work well with the yarn so I just cast-on and decided the details would work themselves out. 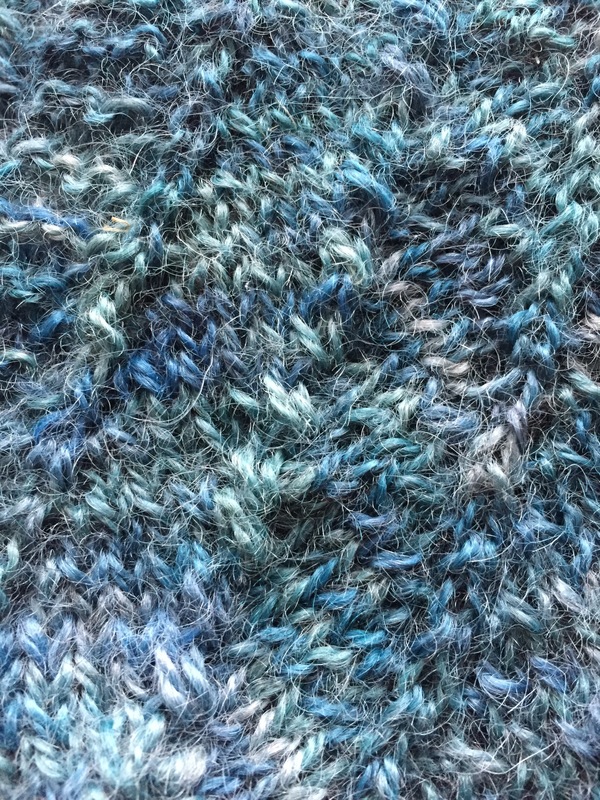 This was the point I knew I would knit this pattern until I ran out of yarn, plain and simple. It’s a cool pattern because it’s really easy to commit to memory and despite having a few little decrease/increase maneuvers, it’s really delightfully simple. Maybe more of a close up for you? Of course! Because I love this slightly rustic yarn in this refreshing color knit into such a pretty little design. And in the end I eyeballed how much yarn I’d need for the garter border and I did indeed knit until I was out of yarn. I blocked it very lightly. Even though I know the stitch pattern might have benefit from a more aggressive take on blocking, I thought a more natural look suited the overall project better. I washed it and literally laid it to dry in the sun on my deck with just the lightest touch to sharpen the basic shape. Admittedly, it’s a little short for a scarf. 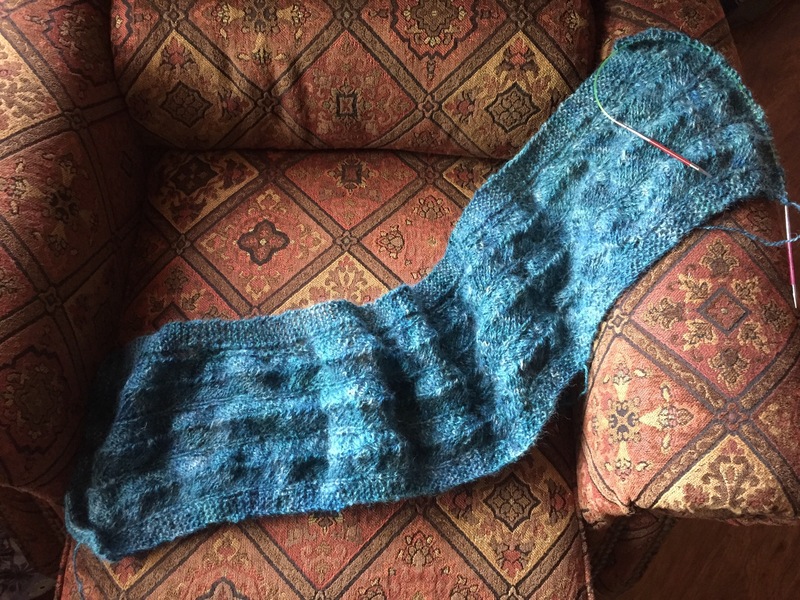 At somewhere around 56-57″ long and about 8″ wide, it’s probably about 15″ shorter than the length of my average scarf. If I double it over the long way and wrap it around my neck I can just tuck the ends back through it though. This will actually be perfect under my winter coat to chase the chill away because it’s also quite warm. 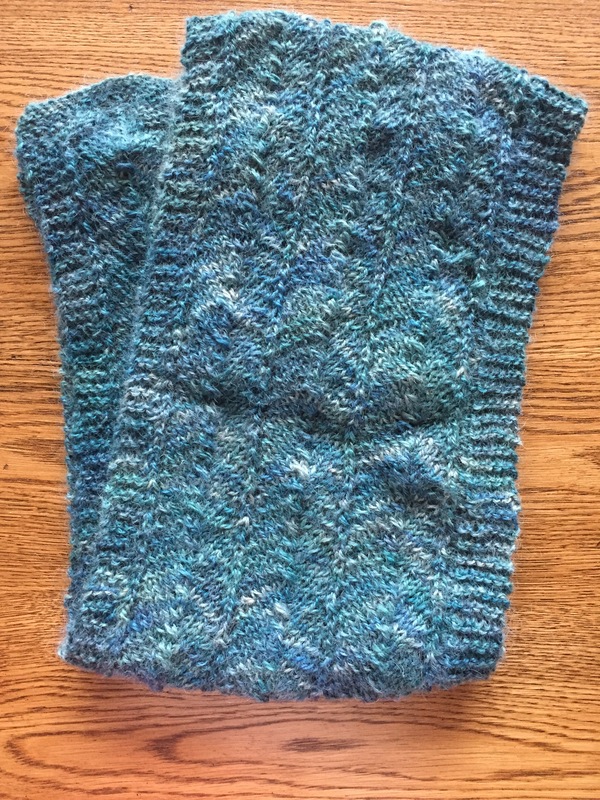 It was truly a lovely knit from start to finish. Are you as excited as I was to open box #3?! Well, here you go! I think these are my favorite skeins yet! These are a special edition of Mountain Meadow Wool’s Mountain Down, a 25% hand-pulled bison from Durham Ranch and 75% Mountain Merino from Camino Ranch, both in Wyoming. 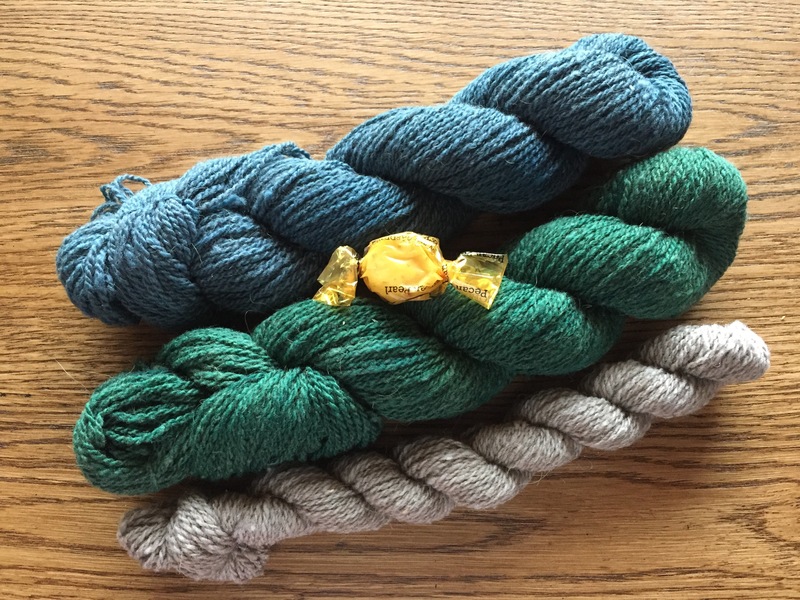 The two top skeins are hand-dyed in the “Spruce” and “Pine” colorways and the mini-skein is natural undyed. I’ve never knit with bison before, so I cannot wait to try it. This blend is extremely soft and I’m guessing it’ll be nice and warm, too. I’m not sure yet, but I’m currently flirting with the idea of turning these into a version of Ysolda Teague’s Elbert hat. I’m kind of thinking I could cast-on and maybe do one round with the natural and then work the rest of the hat in the other two colors. I’m going to mull that idea over for a bit though while I finish up a couple other works-in-progress. I’ve really enjoyed this yarny foray into the ranches of the American West. 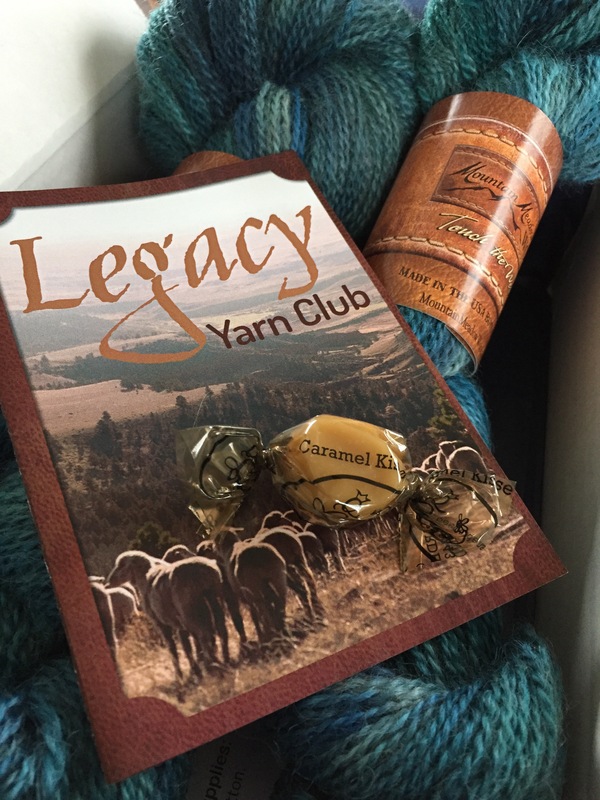 And I have to admit, that the name, “Legacy Yarn Club” is a perfect fit — not only are you investing in the legacy of American ranching, you get to create your own heirloom, your own legacy of knitted items from it. I felt like every package could have been marked, “From Wyoming, With Love” because that’s what I felt when I opened each box — the care and thoughtfulness is laced through the local ranches, the specific info on each skein, and even the packaging. For those interested in trying out the Legacy Yarn Club or maybe just learning more about it, you can find all the info you need right here. You have until July 31st to sign up for the next delivery. Who knows what gorgeous, exotic American fibers could be headed your way! I really love the way the scarf turned out. I haven’t used any of my yarn from the club yet, but I’ve loved every shipment. those colors are all amazing. I love the scarf, and am sure whatever you knit with this box will be equally beautiful! Thank you! I am pretty excited to be able to get knitting with it! Lovely pattern and color. I’m impressed that your garter edging worked out so well. I have trouble with “afterwards” edges. When drying, avoid direct sunlight, magnified sunlight (close to an outside window) or direct heat. Avoid placing your wool sweater – or any wool garment – over a radiator to dry. The part of the garment that is folded over the top of the radiator tends to dry the quickest and can cause the garment colour to change or damage the garment in this area.